The Motorola RAZR i runs almost stock Android 4.0.4 Ice Cream Sandwich, with an occasional custom touch here and there. The overall experience is very close to pure Android - starting from the on-screen buttons, all the way to the app drawer, transition effects and the notification area. We've prepared a quick video of the RAZR i user interface to get you started. One of the few areas Motorola has customized is the lock screen. It features a standard display of current date and time as well as a handy toggle to put the smartphone in silent mode. Pressing on the round unlock button in the center of the lockscreen unveils four different options. One of them is straight unlock, with three added app shortcuts - Camera, Messages and Phone. Sadly, these are not user configurable. Once you go past the lockscreen, you see the homescreen, which breaks down to seven panes to fill with widgets and apps. Switching between panes is seamless with a handy indicator above the docked applications showing you which homescreen you are on. To add or remove panes pinch-to-zoom on any of the homescreens to get to the Manage pages screen. From there you can add additional panes tapping on the plus icon or remove a pane by simply pushing it off the stack. Motorola has added a neat option allowing you to choose either a blank slate or a template. The latter provides you with a pane filled with app shortcuts and widgets geared toward specific activities such as social networking, entertainment, office, etc. The homescreens come with yet another twist. There's an extra quick settings screen left from the leftmost homescreen pane. It's populated with commonly used connectivity toggles such as Wi-Fi, Bluetooth, Mobile data, etc. At the opposite end of your active homescreen panes is the Add a page interface - you can swipe all the way, instead of doing the pinch gesture. A press and hold on the homescreen gives you the option to change the handset's wallpapers. You can do so for both the lock and the homescreen. The app drawer has been taken straight from the stock version of Android ICS. It features two tabs - Apps and Widgets - that break down to side-scrollable pages. If you scroll past the available apps you move into the Widgets tab. There's also a Google Play store shortcut next to the tabs, for quicker access to Android's app repository. You can create folders in the familiar ICS way. All you have to do is drag the icon over the one you want to pair it with. We must note that there aren't many preloaded widgets. However, Motorola's own Circles widget is one of the most likeable we've tried. It offers you access to the clock, weather in different cities, as well as a battery indicator. Flipping any of the three circles (like flipping a coin) switches to an alternative view. The clock can be either digital or analog, while the weather and battery indicator reveal their settings. The notification area is stock ICS. It shows you icons next to the notification, such as the picture of the person who called or messaged you. There's a Settings shortcut for quick access to the phone's preferences. Speaking of stock Ice Cream Sandwich, the Recent apps list hasn't been customized either. It displays thumbnails of the running applications rather than icons in a vertical, scrollable list. You can dismiss apps with a simple swipe to the side. The overall user interface experience on the Intel-powered Motorola RAZR i is quite pleasant. The UI has been lightly, but expertly customized, helping it retain most of the pure Google feel - not a bad thing in our opinion. Still, Motorola could've added some more clever widgets and the occasional live wallpaper, but let's not nitpick. The Motorola RAZR i is powered by a single-core Intel Atom Z2460 processor on the Medfield platform. The CPU runs at 2GHz and is paired with a PowerVR SGX 540 GPU. Don't be put down by the fact that it's a single-core chip amidst dual and quad-core rivals. The Atom Z2460 supports hyper-threading, which basically enables one physical processor to process two threads simultaneously (this is to say it can act as a dual-core CPU). Mind you, the base clock of the Atom Z2460 is 1.3GHz, as it only runs on 2GHz when needed. The clock speed is impressive indeed and Intel even went on to say that it's not coming at the expense of power consumption. Judging by the results from our battery test that's obviously true and the fact that the chipset is built on a 32nm process, probably helps. 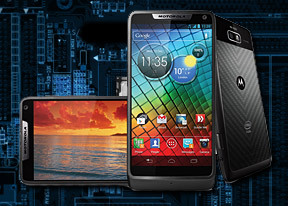 We expected to see a dominant performance from the Motorola RAZR i in the BenchmarkPi test. This benchmark is not optimized to make use of multi-core architectures and since the RAZR i has the core with the highest clock speed, we really though it would crush the competition here. As it turns out, the Intel CPU failed miserably here, coming a long way behind the Krait-packing competitors and even failing to match the scores of those with Cortex-A9 CPUs. Linpack didn't tell a vastly different picture, but at least this time the RAZR i scored higher than the Motorola RAZR MAXX. The Motorola RAZR i suffered another convincing defeat at Quadrant, which is an overall performance benchmark, but at least this time it came much closer to its competitors. We moved on to the GPU-stressing NenaMark 2 test. Intel said that it has increased the GPU speed after moving to the 32nm process and there is indeed a small speed boost. It's still the same old PowerVR SGX540 GPU though, so it doesn't stack up very well against newer designs like the ULP GeForce, Mali-400MP or the Adreno 225. In fact we're already discontinuing the usage of NenaMark 2 for newer chipsets, as they all manage to reach the 60 fps limit of the screens and the benchmark doesn't produce accurate results. The Razr i, on the other hand, managed just 39.7 fps, which might do for most uses, but is still rather disappointing for a smartphone in this price range. The Motorola RAZR i fell a bit further down the ranks in the other browser-based benchmark we ran, but its achievement is still commendable. Beating a couple of quad-core beasts and its Krait-powered US sibling is quite the achievement, considering that the raw power of the chipset is obviously not exactly great.